I hadn’t planned to go to the astronomy meeting the other night, but I had missed several of the previous monthly meetings, and tired as I was, for I had been trail building that day, decided I ought to put in an appearance. It wasn’t like anybody was going to notice my presence, but I would feel better for having gone. January meetings of the Eugene Astronomical Society (EAS) are devoted to the public, where anybody who received a telescope for Christmas can bring it and club members volunteer to show them how to make it suitable for observing. Jerry, the secretary, was profiled in the paper a few days earlier about the event, and I hoped to walk in, look around briefly, and then go home. When I arrived, there were about thirty people, a few talking amongst themselves, the rest clustered around half a dozen telescopes of various sizes. The first telescope I saw was bright orange, immediately triggering memories and interest from me, not only because of the color, but it was an 8-inch Celestron, the same model as my first big telescope. The owner had obtained it from his brother and drove up from Cottage Grove for help. He was being helped by an old guy—these days, that is someone at least in his mid-70s—who was easy to listen to. The old guy—John— was helping align the telescope, and while I had once done that with mine and never again changed it, I stayed silent allowing John’s words to fall over me as memories came flooding back. The night I first observed and somehow found the Ring Nebula in Lyra, M57; the summer night in 1989 I watched the star 28 Sgr pass through Saturn’s rings as the planet’s motion gradually covered it; the two thousand double stars I had “split;” several hundred galaxies identified; several dozen globular clusters seen; a hundred variable stars observed throughout their cycles. I had carried that telescope to star parties in rural Tucson, to schools nearby, and even had it in the parking lot of a hotel at Palm Desert one night in 1995, so I could show interested people—and there were many that night—Saturn’s rings edge-on. I enjoy showing people the night sky, even being auctioned off once for a night’s observing. My first telescope launched me into a twenty year stretch where I was astronomy columnist for the Arizona Daily STAR, and my 750 columns taught me how to write something interesting weekly for beginners, learning to create columns while doing other things, like walking, aimless thinking, or observing the night sky. I tried to see the sky through other people’s eyes. I became a far better observer when I had write what to look for and how to find it. I learned more astronomy through my columns than anybody else. When John showed the owner how to align on Polaris, I suddenly realized I had done this years before and knew what was coming next. Once the telescope was positioned, it couldn’t be moved to make an exact alignment. One had to move the whole system, tripod and all. I had done that automatically every time I observed. As if he were listening to my thoughts, the owner asked whether it would be possible not to use a compass and just turn the tripod facing north. “Yes,” I spoke up. “That’s exactly how I did it.” John looked at me like I was observing in the 1980s. Well, I was. “It’s not exact,” I continued, “and you will have to adjust frequently, but I observed that way for years.” All the stuff I observed I did without using a clock drive, computer, or anything other than star charts. Many nights, I followed a dozen variable stars without even using charts. I found the star as naturally as a musician finds the right chord in a song. I was hearing the music of the spheres. From observing, I became interested in eclipses and began my long career of twenty-six eclipse trips all over the world to see them. I saw totality in the middle of the Pacific, from the Great Barrier Reef, over the Arctic and Antarctic, flights that took me over both poles, Patagonia, India, Aruba, the Bolivian Altiplano, Spain, La Paz, North, East, and South Africa, China, and Siberia. I never thought I would see more than one; I have seen 17. 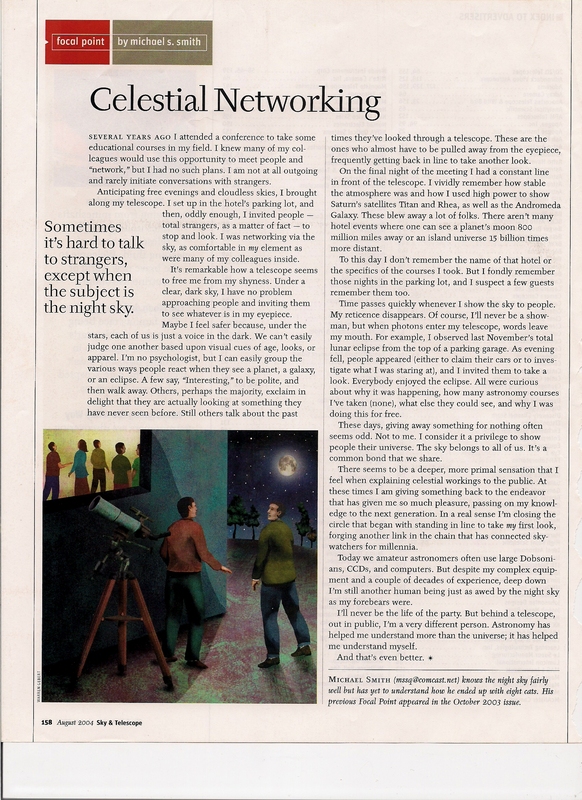 I never thought I would publish anything in astronomy—thirty-one years ago, I published an article about my experience as an astronomy columnist, and I wrote two “Focal Point” opinion pieces for Sky and Telescope one year. While John and the owner were talking, I knelt down by the telescope. How many times, how many hours, how many places, had I done this? Without thinking, my left hand went to the declination knob that controlled E-W, and my right to the right ascension knob that controlled N-S. I was on the ground outside my house in Tucson, where I did most of my observing. This was “muscle memory,” like playing music I had memorized on a piano, skiing the first mogul field each winter, or arriving at the first portage every summer and swinging a canoe up on my shoulders. I was out in the desert at 2 am recording the magnitude of a variable star in Sagittarius for the American Association of Variable Star Observers (AAVSO). The star had recently had an outburst and the observations were needed. One night, near the Desert Museum, I watched the Moon move tangent to a star, seeing starlight blink in and out through the lunar mountains on the edge. That grazing occultation was data for the International Occultation Timing Association (IOTA), to which I once belonged. I tried to give back to the field when I could. Another summer night, I watched at 4 am as the Moon uncovered four moons and then Jupiter in the pre-dawn sky. I saw so many meteors out of the corner of my eye when I was observing. Fortune favors the experienced eye, and I was experienced. During the Leonid shower of 1999, I saw three hundred meteors in less than an hour, and four times I saw 5 instantaneously. John had suggested that the owner see if Jerry, the EAS secretary, had any eyepieces he wasn’t using, for the owner needed a good low power eyepiece. Jerry came over, admitted he didn’t have any, and took a look at the telescope. He admired the age and condition, older than my 1983 purchase, for mine gave the focal length in mm and this one in inches. Jerry identified the outlet type for the drive motor and knew the name of a store who had a cord that could plug into this unusual outlet. He even knew the voltage. Jerry knows just about anything, and hearing him talk makes my head shake in wonderment. I was so lucky to see so much, the zodiacal light from Sonoita, “false twilight” that occurs well after dark or well before morning, when the dust in the plane of the solar system is illuminated by the Sun below the horizon. I saw rainbows seven minutes after sunset. In a thirty minute period one night, near a small cloud, I saw cloud-cloud lightning, Jupiter, and a meteor shoot between the two. Sleeping under the stars in the high grasslands, my wife and I watched the Milky Way rise like a giant cloud–which it is. We saw Orion reflected in a wilderness lake at 1 am and the aurora shoot across the sky in the canoe country. An observing session was once interrupted by a rattlesnake, whose buzzing I couldn’t understand until without thinking I jumped back as the reptile slithered past my tripod to the open desert. I went to the meeting to make an appearance. I had no preconceived notion what might happen and was astounded with the experience. I shouldn’t have been surprised, for astronomy was like this many nights when I took my telescope outside, scanned the night sky with my eyes, and began to observe. This entry was posted on January 19, 2019 at 08:10 and is filed under Uncategorized. You can follow any responses to this entry through the RSS 2.0 feed. You can leave a response, or trackback from your own site.